Mountains, rivers, valleys, hills, canyons, and more mountains. Rain, sun, heat, cold, and wind, but mostly perfect conditions. Incredible views, great towns, campgrounds, and people. This was my third tour with the MVBC and it was very enjoyable. On the first tour I hardly knew anyone. Now I know most of the people. This was an especially great location. 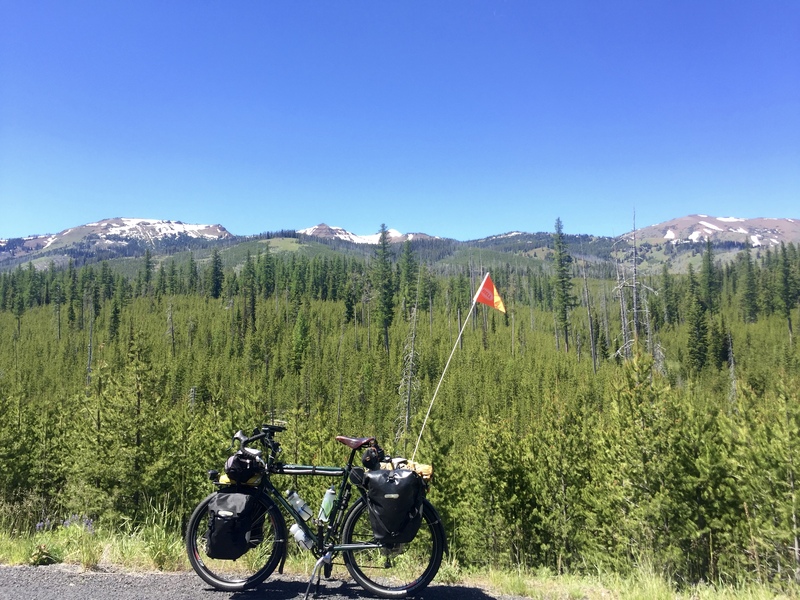 It also gave me a chance to fill in the missing piece from my 2010 tour when I wanted to ride the Wallowa Mountain Road but it was closed due to a washout. That two days of riding was probably the best on this trip. You can view the slideshow below in full screen. Below is my log for each day of the tour. Use the navigation controls to scroll through the days . Day 1. Rainy cold day. We had a nice tailwind heading out. I was riding with Robert and Dan B, although they were usually a ways out front. We made a nice loop of the valley to Union. It was starting to rain harder so we ducked into Gravy Daves. We filled the place up and spent a couple of hours waiting out the rain. When we left it was still cold but we soon started climbing, and the clouds started breaking up, and when we got to the campground it was sunny and warm. Day 2. The 5.5 mile climb up Catherine Creek was gorgeous. Nice forest of pine and fir. Then after a short downhill came a series of long rollers, as the treebs gave way to sage brush and grassland. We stopped at an old run down oasis in Medicinal Springs. Just as as was about to leave I noticed my rear tire was very low. I pumped it up and continued on. We did a bunch of climbing over naked hills before dropping down and crossing the Powder River. Not much of a river at this point. Then lots more climbing. On a short downhill I noticed my tire was low again. Pumped it up again and rode a short distance when I finally got to the top of the climb since the SAG wagon was there with my spare tires I changed it out. 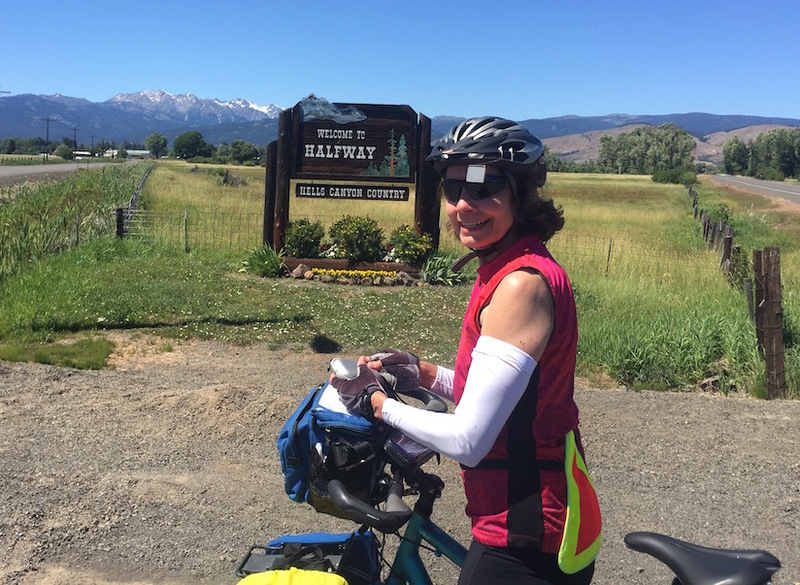 Felt much better on the downhill and the rest of the way to the high school where we were camping in Baker City. I really missed an opportunity to get some great panorama shots on this ride. 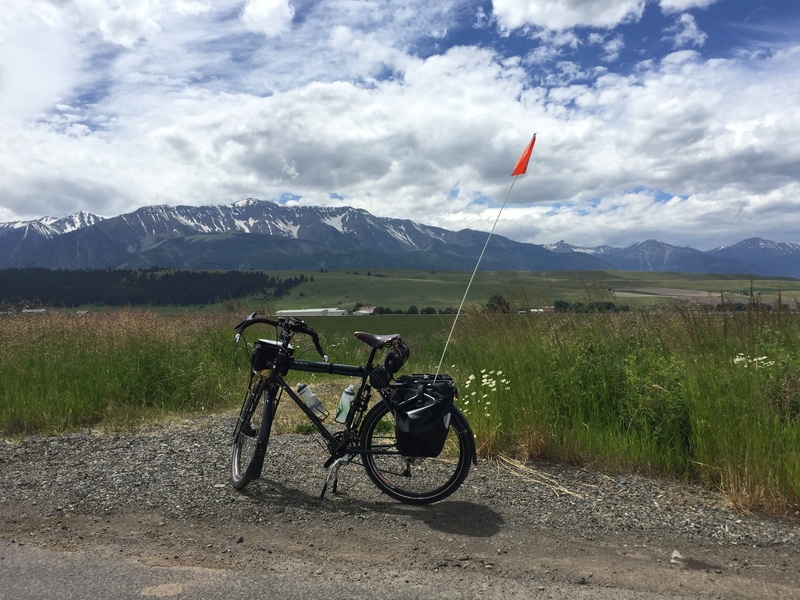 From several points on the ride you had views of both the Elkhorn and Wallowa ranges. First summit but not the highest we would get today. Annie took this one of me working on my bike. This was after I changed the tire. I did this ride 6 years ago but did not remember all of it. Leaving Baker we climbed through some scrubby hills before a long decent down Eagle Creek, only it wasn't all down hill. It just kept carving a canyon through the barren hills. Eventually we got to Richland which is well watered and green. Hung around Richland for some time helping Robert and Jean with a tire problem. It got hot, at least 90 as we tackled the big climb out of Richland. The road carved long steep switchbacks through the naked hills. From the bottom you could see the cars miles above just creeping along. It was hit but the wind really helped. I stopped 3 times to catch my breath and cool off. This really made it manageable. The sign at the top said 3 miles at 7% but of course everyone swears it was longer and steeper. Had a wild time coming down the other side. There was a lot of wind and I was holding back my speed. All of a sudden I see Tad and Anne on their tandem right on my wheel ready to pass, but just then 3 big RVs came along one after the other. Tad and Anne managed to slow down and pull in behind me as the RVs passed, but it was a tense moment. Then a little further down the hill a wind gust really knocked me sideways. I was very happy to get to the bottom of that hill. Halfway is just as beautiful as I remember it. Less snow left in the mountains than there was 6 years ago. We're camped at a school under some nice shade trees. We had a wonderful group dinner at Wild Bill's Saloon. Lot's of fun. Looking back at the Powder River on it's way to Brownlee reservoir from the base of the big climb. Much further up the climb you can see the green from the photo above way down below. I caught up with Brandy just as we were entering town. An absolutely gorgeous ride. One long summit, but never too steep, through beautiful woods along North Pine Creek. 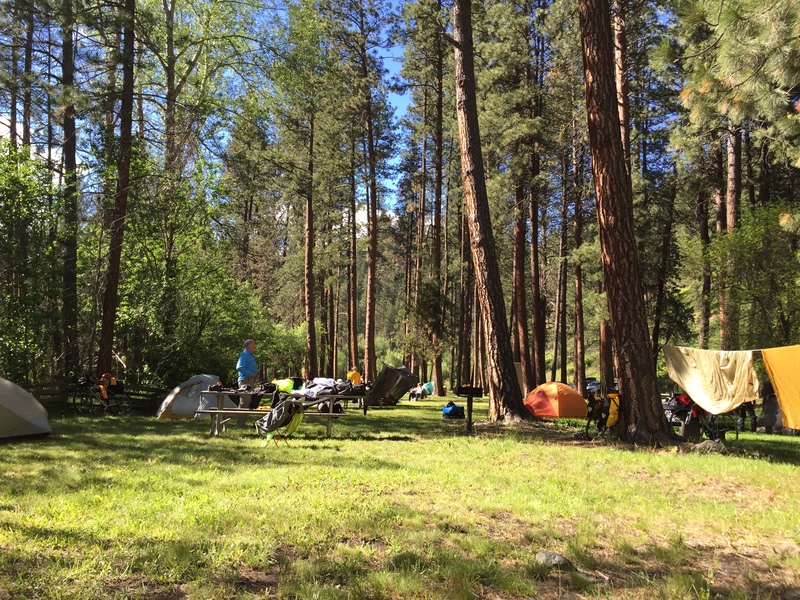 Camped along side the Imnaha River. 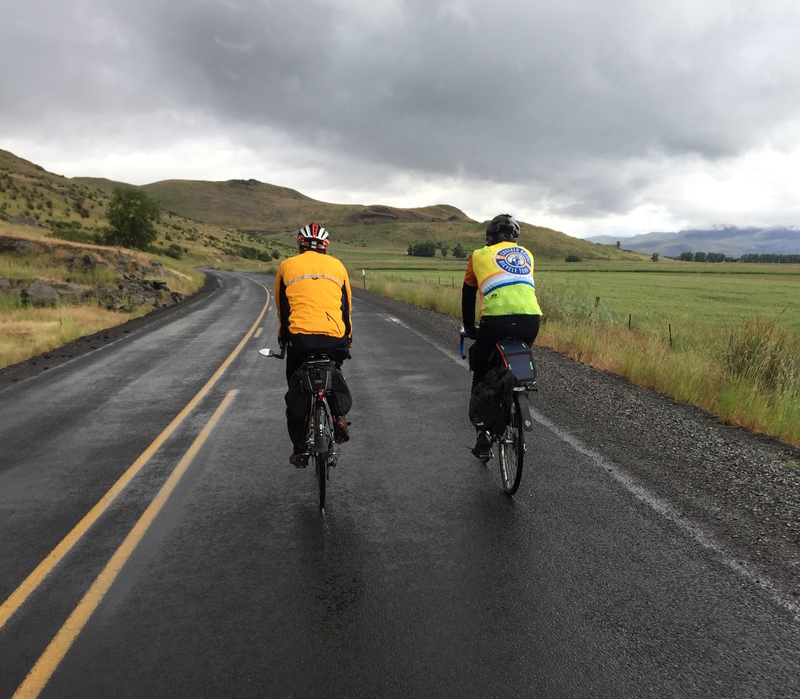 The ride started with about 10 miles of downhill through some very scenic country along Pine Creek as it made it's way to the Snake. 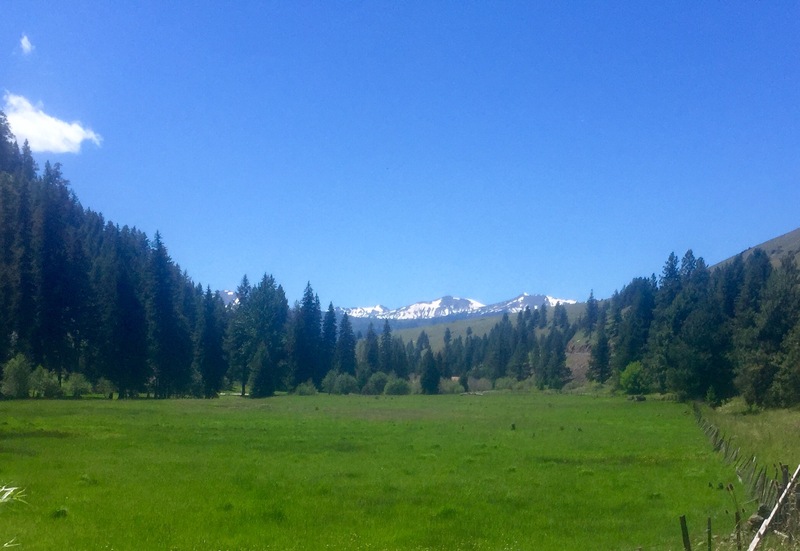 We then turned up Wallowa Mountain Road. This was the road I wanted to take 6 years ago but it was closed due to a washout. So it was very fulfilling to get to ride it now. It started out through beautiful woods and nice cool air. Sometimes I could see the naked hills far above and feared we'd eventually leave the woods, but we never did. The woods changed to mostly pine as we got higher but never gave out. It was a long climb but eventually we got to the turn off for the Snake River Overlook. Here I ditched my panniers in the woods and did the final 3 miles with a lighter load. We spent at least an hour on top lounging around and enjoying the view. You couldn't actually see the Snake River but the view was spectacular none the less. 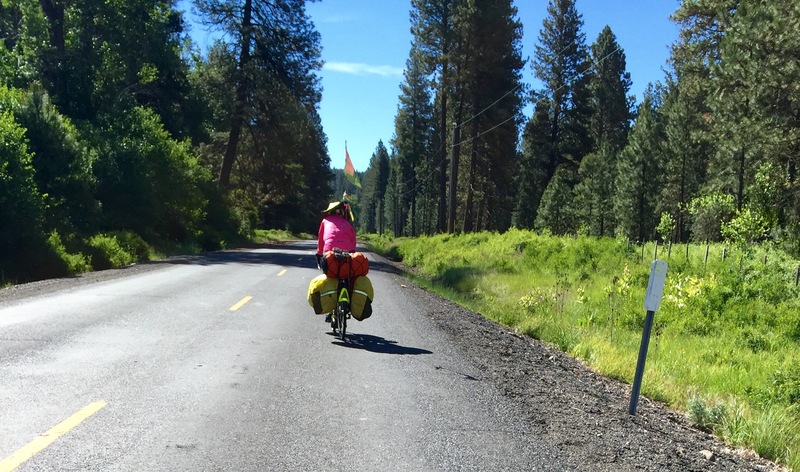 Then it was a fast downhill to the Ollokot campground on the Imnaha River. I found a spot close to the river and was very happy to be lulled to sleep by it. I did not know it at the time but Ollokot was Chief Joseph's younger brother and the leader of the young warriors who chose to fight the army that forced them off of their land. 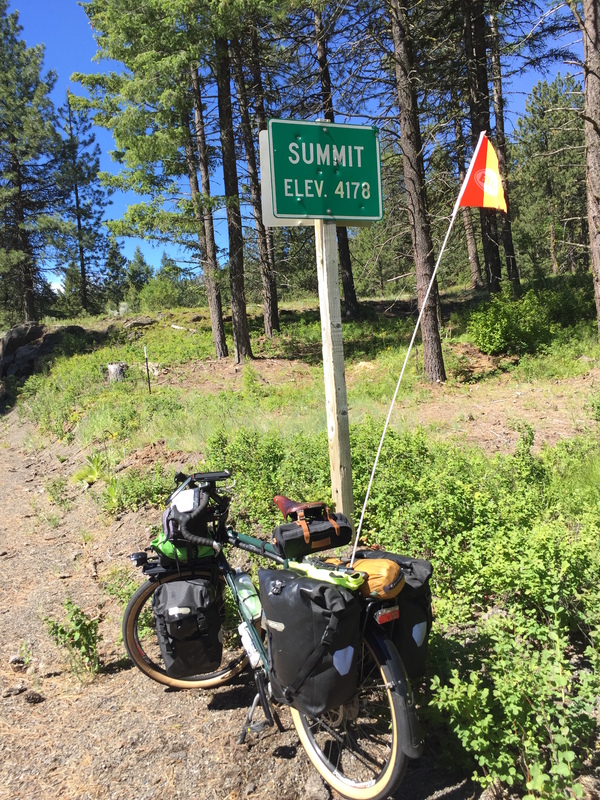 Two summits, and then a steep "bump" at the bottom. Another perfect day weather wise. From Ollokot CG there was a short downhill section on rough pavement before we started climbing again. Then it was a long climb to one summit, some fast downhill, and the another long climb. The first one was all pretty lush woods, but at the top of the second climb the trees got very thin. Looks like maybe a fire some years ago. Also pretty close to the tree line. At the end of the Wallowa Mountain road was a nice green valley, and then a junction with a main road. 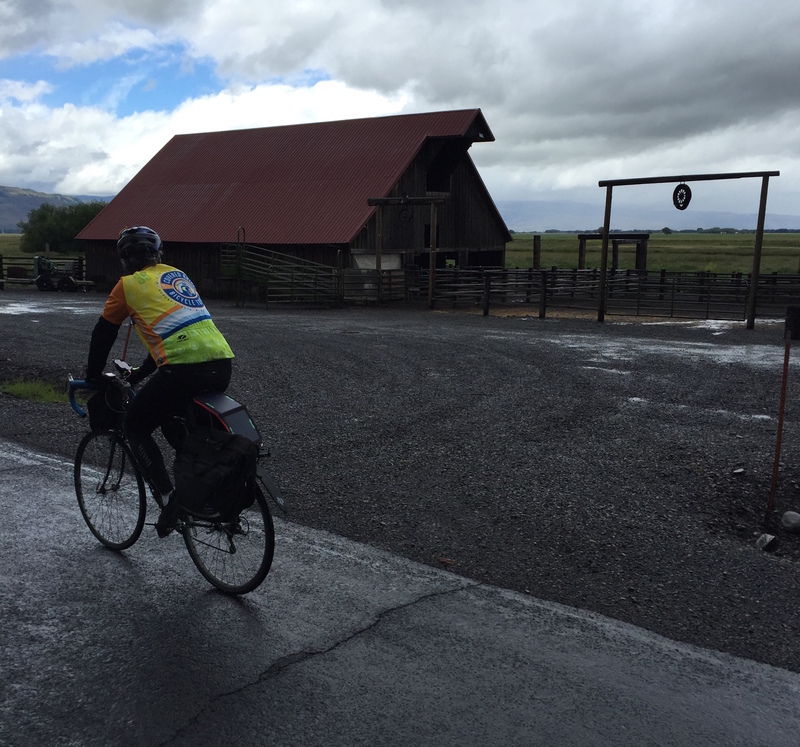 One way went to Imnaha, which is the eastern most town in Oregon, and our way went to Joseph. But not before another climb, much steeper than anything we did in the mountains. It was now hot as well. Fortunately it was only a mile or so and then things leveld off. I stopped to take a lot of pictures but my lense was dirty and they were all foggy. The first horse I saw coming into Joseph was a Belgain. 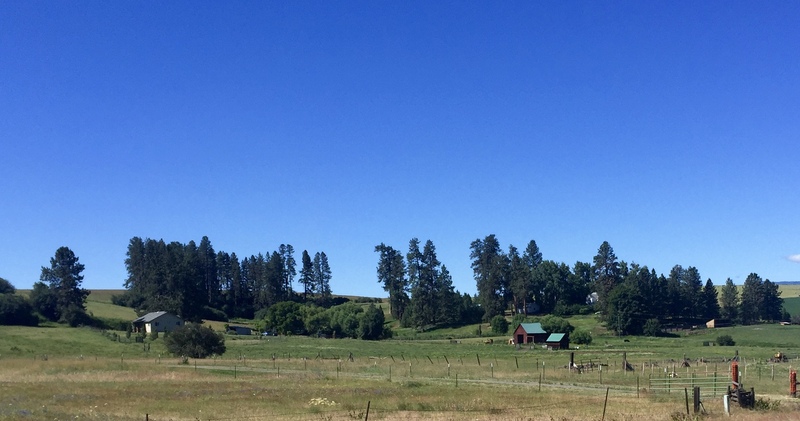 I saw no Appaloosas but later learned that none of the Nez Perce live here. 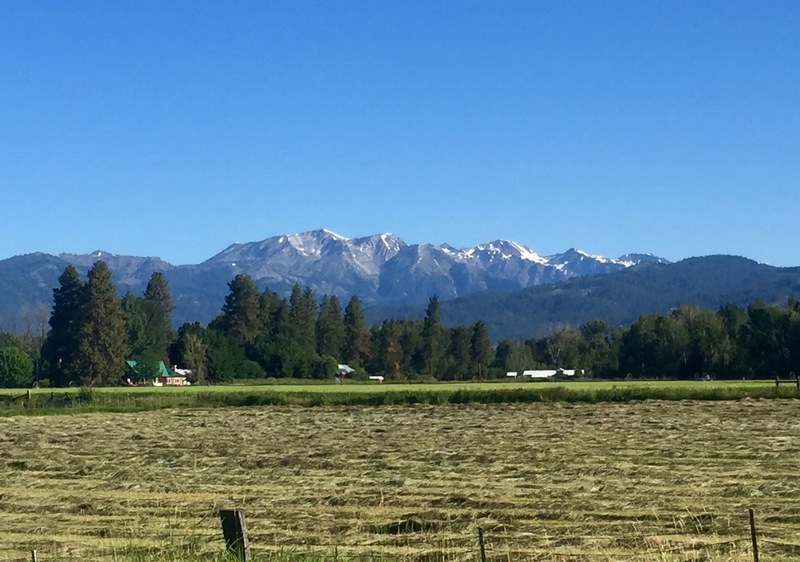 The main tribe is in Idaho (where I passed through in 2010), but the decendents of the Wallowa band are on the Coleville reservation in northern Washington. More on this later. When I got to town some of our other rides flagged me down at a burger joint on the corner, which had shade and nice cold milk shakes. I didn't need much prompting to stop and hang out for an hour or so. Then it was on out to the lake, which entailed a bit more climbing to get out of town, but then mostly flat along the lake. The views here were spectacular as well. The state park is on the far end of the lake tucked into the mountains. The group campsite was not thet attractive due to lack of shade, but I found a spot that would be shady later and it worked out okay. We would spend two nights here. That evening we had a special gatering with our guests of honor Richard and Lindy Burgess. Some long time members had some good tails to tell of past tours. Layover day. Rode around taking pictures as the ones I took yesterday were all foggy due to a dirty lens. It was cloudy and cooler today which was very nice. First stop was the gravesite of Old Chief Joesph which is on a nice hill overlooking the lake. The sign says he was moved here after his original gravesite was desecrated. This would have been fitting had it not been for the white settlers also buried here. I was especially unhappy to see one white settler even had a more prominent spot over looking the lake because he was "a friend to the Indians". I soon realized that the entire town of Joseph was filled with indian imagery and history, but all from a white perspective. There was no native presence and nothing that seemed authentic, with the exception of the Homeland Project center. I went up Prairie Creek road, past and old cemetery and continued on when it turned to gravel. It eventually met another road which looped me back to the highway. On the way back I hung out in town a bit with some of the other riders. 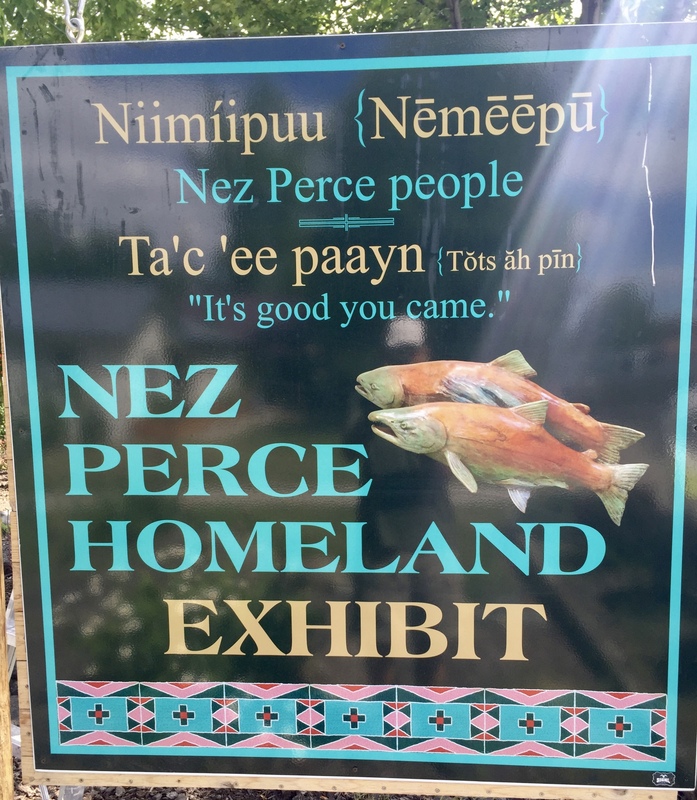 I also stopped at a small interpretive display for the Wallowa Homeland Project. I learned that they had some land adjacent to the town of Wallow, and hoped I might be able to see it when we go through there tomorrow. This got me interested and led the way to a nice connection the next day. Downhill into the wind. As the day wore on the slope got less and the wind got stronger. The highlight of the day was the Homeland Project of the Nez Perce Wallowa Band. http://www.wallowanezperce.org/ . They have an office and display in town where I met Amy. Though not a native she was very passionate about talking to people about the history of Chief Joseph and the Wallowa Band, as well as the Homeland project effort to build a place for the decedents to return to the Wallow region. We talked for a while and Amy said I should go out to there land which was very close, so I did. First by myself and sat and had lunch outside of their ceremonial arena, then with Brandy and explored the longhouse, and back out again with Robert. 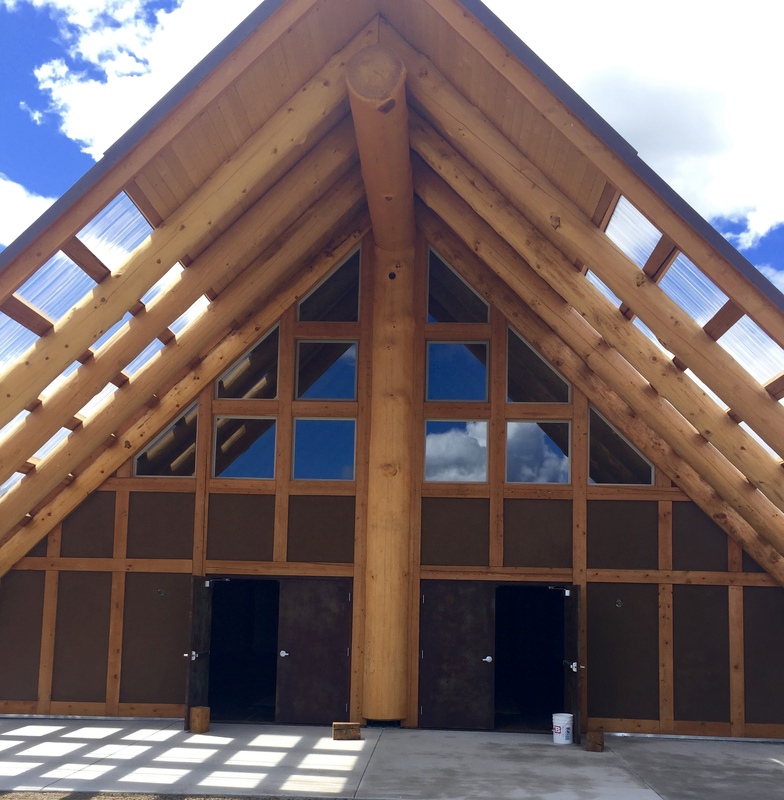 We talked to an electrician who was working on the longhouse and it became clear that this project was started, and kept going, through the efforts of local white people who sincerely wanted to build a place where the decedents of the Wallow Band could gather in their original homeland. I was very inspired by this and left with a good feeling, hoping maybe I could contribute is some way. The rest of the ride was downhill into a mighty wind. This should have been our easy day, but instead we had to struggle just to keep moving into the wind. Camping was at a wayside along the river. Nice but close to the road. This structure was built back in the 90's where they've had a gathering every year since then. 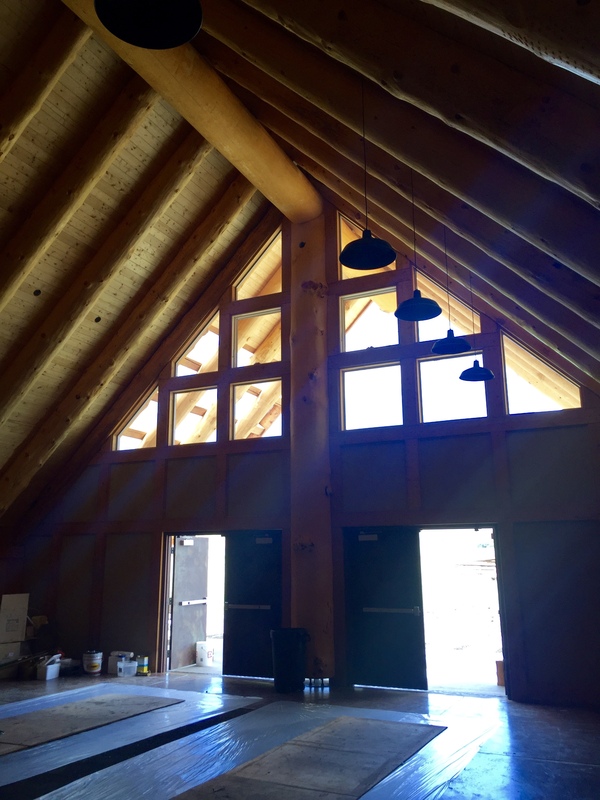 The longhouse is still under construction, but nearly finished. Everything was built according to specific traditions. The center section had soil from sacred ground, which was covered during construction. 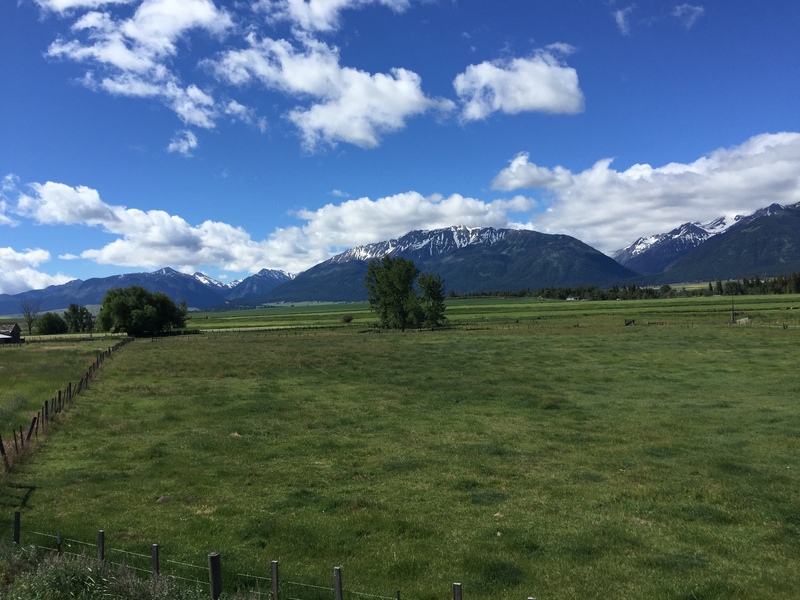 View of the Wallowas from the homeland project land. Nice climb early. Then rolling into Elgin. Took the alt route with 10 miles of gravel. From the wayside it was downhill to MInam, which had a kind of resort. I stopped at the little store there and was happy they had my favorite ice tea. 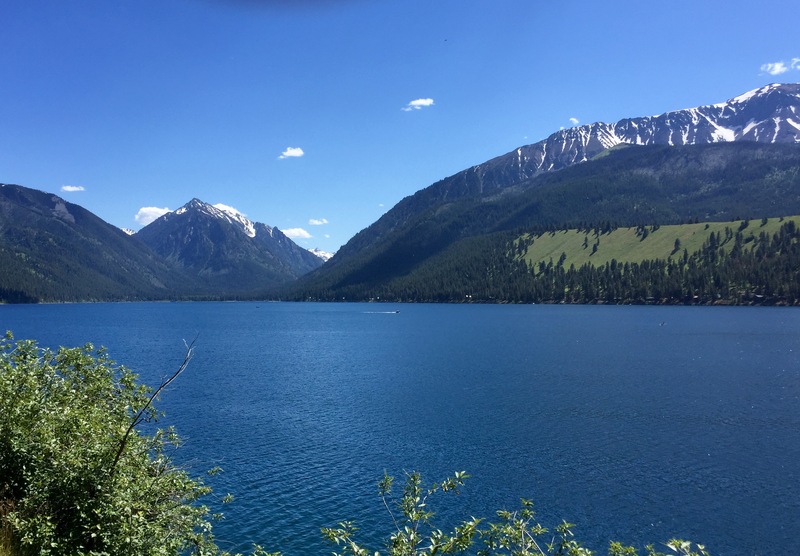 This was at the confluence of the Wallowa and Minam rivers. From there the road started to climb. The climb took us out of the woods and onto the rolling prairie. Some nice farms on the way up. After that it was some long rollers on in to Elgin. We stopped in Elgin for a while at this little park square. Some people had a second breakfast. From here I teamed up with Steve, Joe, and Robert and we diverted to take the alternate gravel route. This was a great change. Nice and quiet and hardly any cars. Some short steep hills to grunt up, and great views of the farmland and the mountains beyond. It was quite a bit longer than I expected. Steve, who plotted the route, had at time said "a couple of miles", or "about 5 miles". It was 10 miles on the gravel, which was mostly well packed and easy riding. After the gravel we still had a long ways to go and it was getting hot. I stopped in the shade of a tree by a farm house to have a snack and cool down. Lyle passed in the SAG wagon so at least I knew I was on route. Then Steve came by and we finished the ride together. Cove Warm Springs offered a nice grassy place to pitch our tents, a covered area with picnic tables to have our potluck, a pool, and hot showers. The shower was good and the pool was lovely but not quite warm enough for my liking. We had our potluck that evening. This started out as a "whatever is left in your panniers" kind of meal but over the years morphed into a "go to the store and get something good" meal. However this store didn't have much of a selection so the meal was closer to the original intent. There was plenty of good stuff to chose from, and we all had a good time. We had climbed out of the woods now. This farm as at the top of the hill. 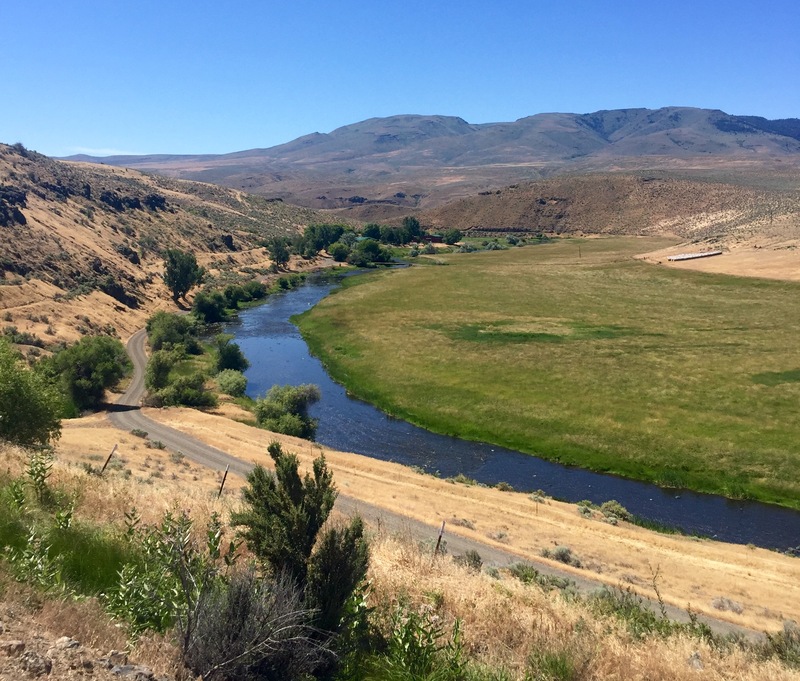 The Grande Ronde River as we were entering Elgin. End of Loop Tour 2016. Lovely warm morning. The final day is always short and somewhat anticlimactic. A few miles out of Cove we hit the road to Union and were and on the road we started on. 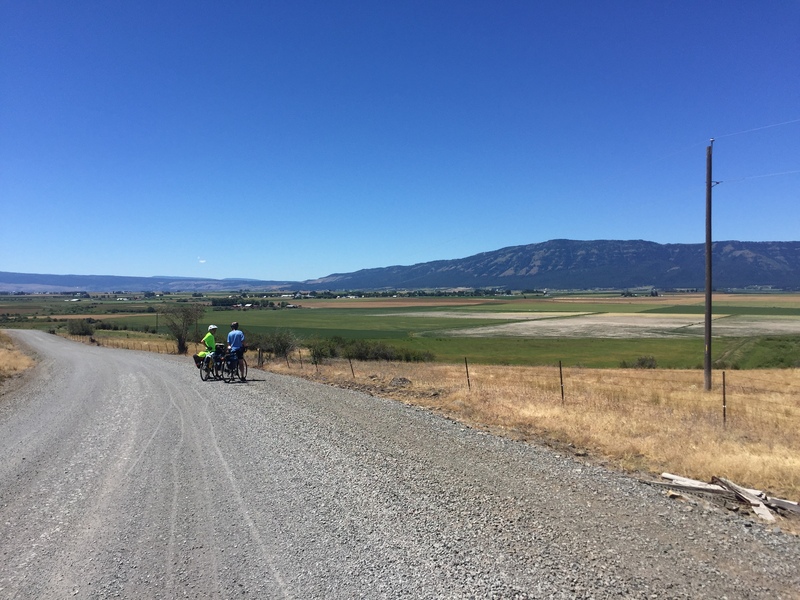 The tour planners mixed it up though and we followed an alternate route on into La Grande, which added a few miles and made it an interesting ride. 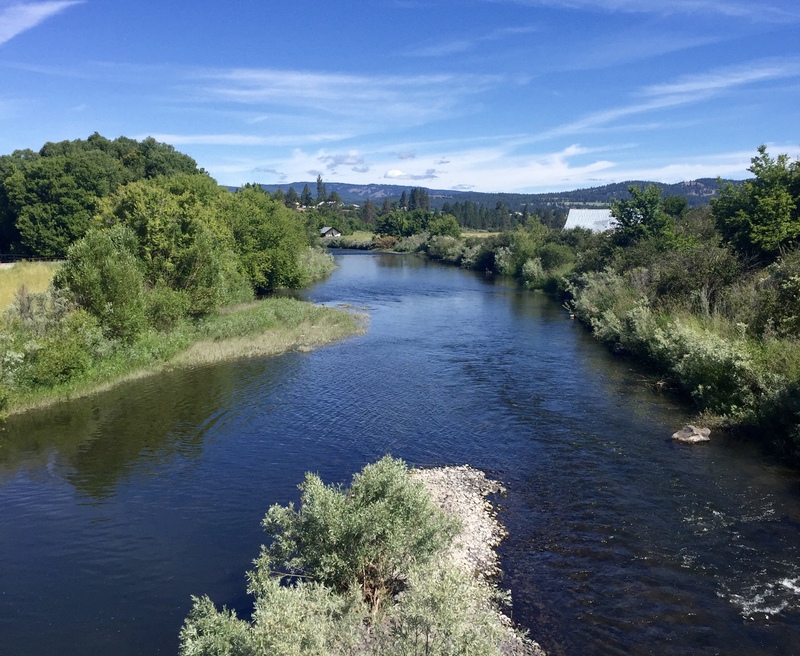 Part of it was again on the Grande Tour Scenic Bikeway. I stopped at Safeway to eat something and stock up since my tour would continue. Found my way to the starting point and said farewell to everyone. Then I was off with Robert to Hermiston were I got a motel and would begin my next tour.